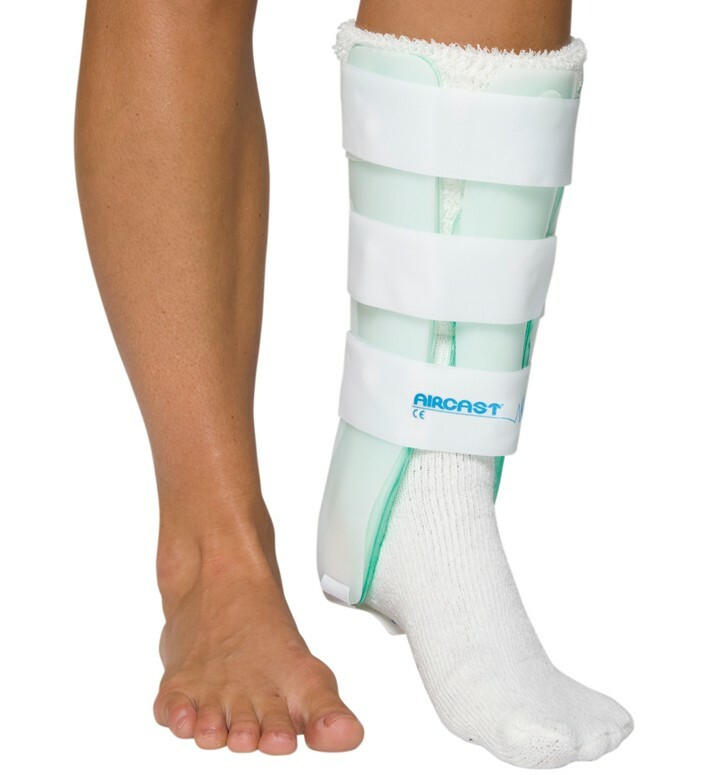 The Aircast Leg Brace helps to guard and stabilize the lower leg after an injury to assist with rehabilitation. It uses the well-known protection of the Aircast Air-Stirrup but is designed to guard the entire lower leg from harmful movement - not just the ankles. Many leg braces heavily restrict leg movement. The Aircast Leg Brace allows for functional management of the injury, which means that you can move around while your leg heals. It's designed to get you back to regular activity. You can even wear this brace with your shoes. The Aircast Leg Brace comes in two models, one specifically designed for the left foot and one for the right foot. If you need extra shin protection you can also select the removable anterior panel which helps protect along the inside of the leg. Product Features... and the benefits you'll experience with the Aircast Leg Brace! Semi-rigid exterior helps provide protection and stabilization for the leg. Patented dual air cell system provides pulsating compression while walking. Pre-inflated air cells make this brace easy to use, and best of all, comfortable! Flexible, anatomic design conforms to your leg and the Aircast Leg Brace even fits in regular shoes. If you need extra protection of the shin bone, you can include the anterior panel for when it's needed, and remove it when it's not. Click on the Size Chart tab above to learn how to measure your ankle to determine what brace size you need for the Aircast Leg Brace. I have a stress fracture in my tibia, and I want to treat it as effectively as possible. Would you recommend using this brace or a full boot (if so which one) for most efficient treatment? Thank you. I am looking to stabilize my front lower leg. Xrays do not indicate a stress fracture but after 3 weeks I am concerned that no support is damaging my leg. Would this be appropriate? The aircast Leg Brace would be an appropiate brace for your injry. I am recovering from a fractured talus and am having pain in the area of my achilles as I am beginning to walk again after 8 weeks. I have an upcoming overseas trip and would like to be out of my boot while traveling, but I still want support. Will this provide the support I am looking for? You should check with your health care practitioner on if you can wear something besides a boot for your fractured ankle. Does this prevent excessive dorsiflexion? I am recovering from an achilles rupture 4 months ago and would like to find a brace that will allow me to walk while protecting my foot from excessive dorsiflexion while going up stairs or walking up hills, etc. I have broken three bones at, above my ankle. Orthopedic Dr prescribes Ankle Stirrup brace -R- ankle frx. This looks much sturdier than the 10" ankle sturrups. Is this appropriat for that use. I would like highest degree of protection. You will get 5.5 more inches of stirrup wit ht leg brace. This doesnt mean it gives more stability than the stirrup you are in gives for the area of your injury. Can you use this for severe shin splints? Is it a good option? This is more for very high ankle sprains, or stress fractures. I would suggest using the Procare Calf sleeve. It is going to give the compression your muscles need to help take the tension and stress off of your shin area. Does this product allow for any athletic activity? This ankle brace is indicated for fracture injuries such as a stress fracture, stable fracture. If you need a brace to wear as a preventative measure while engaging in an athletic activity consider the Aircast Sports Stirrup Ankle Support or the Aircast A60. i have used this product and i must say that it have helped me with my line of training and practice in sports. I have a stress fracture in my left shin and by using the air cast it have given me a ease. This has been very helpful in supporting my leg, which was still hurting after a break and removal of cast. Easy to move around in and not too bulk to fit under jeans. Pros: Lightweight, supportive, easy maintenance/clean. Cons: Top velcro strap could be a little longer, otherwise no cons. This is great for my lower fibula fracture. It gives great support compared another brand of lower ankle support brace. However the left side of the brace that sits against my fracture does not hold air. There is some kind of goo in the inflation area that seals it. There was plenty on the right side, and it sealed fine I wish it was more comfortable. I walk 15 miles/day. I have developed shin splints possibly due to a stress fracture in my left leg. Although for insurance reasons, my orthopedic surgeon would not test for stress fracture, a friend who received his doctrine in dentistry of all things recommended I look online for an aircast with shin protection. This product took all my pain away and enables me to walk unlimited miles/day. After suffering for 29 months with my ankle/leg injury, I now walk pain free! My hope is that someday I can walk pain free without the aircast but til then I can't believe after all this time I finally feel normal again! Good support of leg just needs better Velcro strap. I think the brace did its job however the Velcro piece on the top broke the first time it was worn so we've had to apply tape over it when worn to secure the brace.